Website graphics enhance the design of the technology savvy website. I can implement branding created by a graphic designer or created the website design elements that define the appearance of the website. Jennifer Joyce Covello is a speaker, and inspirational coach. Jennifer has a website, enewsletter and a presence on Facebook. It was essential that the look and feel be the same on every format. To accommodate the dimensions of each format, the graphics are composed to spec and fit beautifully. 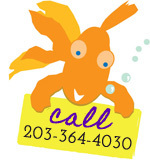 Caroline Temple is a therapist in Fairfield County, CT. Caroline had a drawing that she wanted to use as the logo for her website and programs. She knew she wanted to use muted blues and lavenders in her website and wanted the logo to be consistent with the other colors in the website. Design to Spec turned Caroline’s drawing into vector art, a digital drawing, and incorprated it in to the colors and font that would be used on the website. Add impact with an animated GIF. Artist and self-development author Antoinette Martignoni wanted to use the free blogging services on WordPress, but wanted it to look like her work and her website. Design to Spec created a masthead for the blog, incorporating Martignoni’s work and the title of the blog.